Heronswood International Plant Exploration Consultant, Simon Crawford, will speak about an exciting new plant, the Kennedy Irish Primrose, at the Philadelphia Flower Show on Sunday, March 6th at 11:30 am in Room 201-C at the Pennsylvania Convention Center. This spring, Heronswood will present this new rare selection of old-fashioned primulas bred in Ireland. These delightful plants feature distinctive foliage and the timeless, storybook quality blooms. Mr. Crawford has been exploring plants for Heronswood, The Cooks Garden and Burpee since 2008. After a career in breeding tomatoes Crawford transferred to flower research for Pan American Seed Company, firstly in Cambridge, England and then in Chicago. 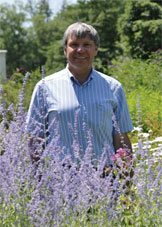 After a plant hunting trip to Nepal in 1989 Crawford fell in love with herbaceous perennials and has focused on this class of plants for the last 15 years. He is also a member of the Royal Horticultural Societies Herbaceous Plant Committee and regularly judges floral exhibits at Chelsea Flower Show. Please join us for this look into the world of rare primroses, and Irish cultivars in particular, from the history of their origins to today. Heronswood sponsors Mr. Crawfords talk at 11:30 am on Sunday, March 6th, in Room 201-C at the Pennsylvania Convention Center.